[back wrapper:] Bayonne, Imprimerie de Duhart-Fauvet, [ca. 1807?]. Large 4to (27 x 20 cm). 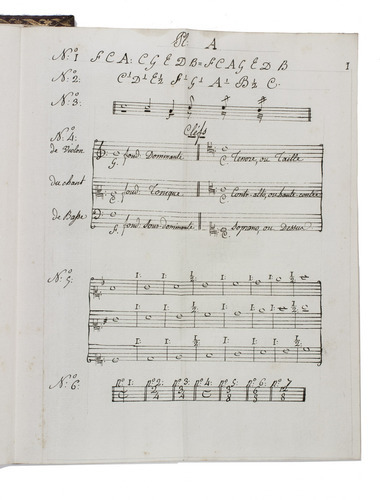 With 11 folding "plates" containing manuscript examples of mensural music. With no title-page, but with the letterpress title and composer's name on the front wrapper and the letterpress imprint on the back wrapper. 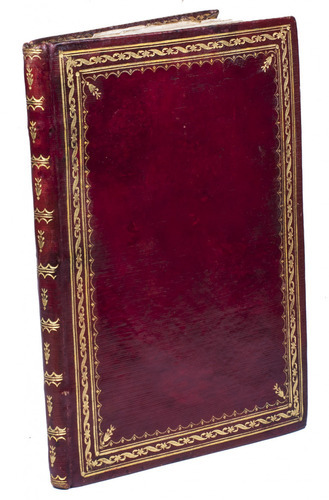 Bound with the wrappers in contemporary gold-tooled, long-grain red goatskin morocco, gilt edges. 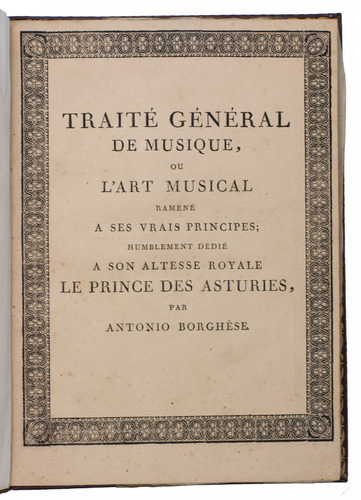 Second copy known of a general introduction to music theory, composition and performance by the Italian composer and music teacher Antonio Borghèse, printed but probably never published due to the chaos resulting from the abdications of the Kings of Spain at Bayonne (where this treatise was printed) in 1808 and the ensuing Spanish revolution and Napoleon's invasion of Spain. It was clearly supposed to have engraved plates, for the printed text refers to them parenthetically in the form "voyez planche A, no. 6" etc., but they were apparently never engraved. 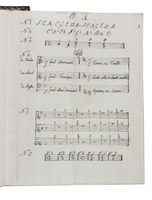 The author-composer therefore inserted what are probably his own autograph models for the plates, with mensural music illustrating various points in his book, some simple and brief, showing things like the forms of notes and rests of various lengths; others showing whole pages of polyphonic music with up to eight five-line staves. 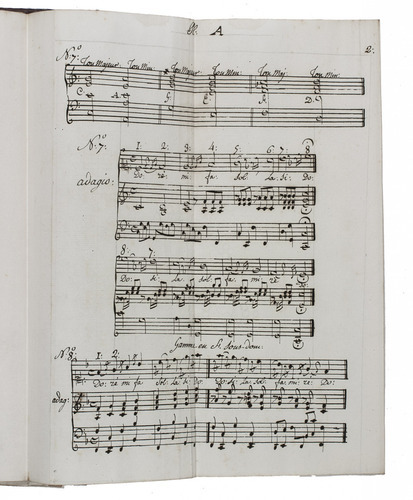 Borghèse attempts to cover both the art and the science of music, both theory (part 1, pp. 1-22) and practice (part 2, pp. 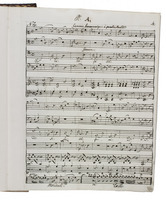 23-65), including both composition and performance, vocal and instrumental. Although the present book is undated, the dedication to the Prince of Asturias, the Spanish crown prince, clearly refers to the future King Fernando VII, who was Prince of Asturias from 1789 to 1808, so the book was almost certainly printed before his arrest in October 1807. 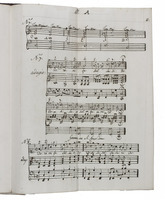 If Borghèse had this copy bound with his original manuscript examples of music for presentation to Fernando either when he was crown prince or during his brief and ill-fated first reign as King of Spain, there is no indication that he ever received it. The Bibliothèque Municipale de Toulouse has the only other copy located, and its catalogue mentions no plates. With a small stain at the head of the leaves, not approaching the text, and minor foxing in a couple leaves, but generally in fine condition and with generous margins. 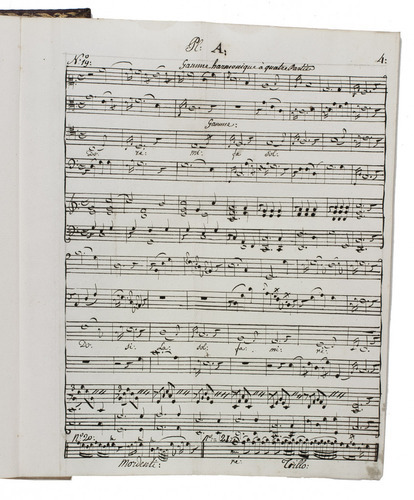 The manuscript music samples show a couple creases, a couple faint and small stains and one tattered edge, but all are very good or fine. The binding has very slight wear at the extremities but is also generally fine. Not in BNF Paris; KVK; WorldCat.